Wow! Having two little readers in this house has certainly kept me busy and I feel my days are so full - full of giggles and new baby smiles, full of cuddles and lullabies, full of BookBairn singing nursery rhymes and dancing, full of nappy changing, shoogling and drinking milk. And full of new stories. We have been sent lots of lovely new books and I did manage to find a moment to update the Favourites Shelf. This is one of BookBairn's favourite books to read with visitors. She often invites our friends and family to join her on the 'beautiful chair' and read this one. Its a magical story of how a bare winter tree is transformed through the seasons. But with a difference. Little fingers have to act out certain actions to make the tree change. Tap the pink blossom buds to make them open, wiggle you fingers to make the leaves change colour, shake the book to make the leaves fall off. It's just so clever how it teaches little ones about the seasons, tell a magical story and get them joining in. BookBairn loves these sorts of books where she feels like she is influencing the story. To check out our favourite interactive books you can find them all here. What's bigger than a digger? Bigger than a dinosaur? A diggersaur of course! BookBairn loves this one! And who can blame her? It's a toddlers ideal combination - diggers and dinosaurs. With bouncing rhythmic rhyming introductions to each diggersaur, brilliant illustrations and opportunities for discussing colours and numbers it truly is a brilliant read! If you fancy winning a copy of this toddler-friendly story check out our original blog post and our social media (competition closes 8.7.17). Bear is not a happy chappy. This little red bug has landed on his nose and taken up home amongst his soft and cosy fur. But bear doesn't want a bug. How can he make him go away? Fortunately owl has a solution! This is a great story and BookBairn likes acting out when the bug lands on bear using her little bug cut-outs that the publisher sent us (but it makes me think I should do this more with her books and create little characters so that she can act out parts of the story). This would also be a great introduction to some natural science by discussing symbiotic relationships - but perhaps I should wait until BookBairn can pronounce the term before I mention it! One of our most consistent re-reads is The Colour Monster. BookBairn loves the characters in the book and enjoys seeing The Colour Monster change colour from page to page and talking about the different colours. But she also adores the pop-up elements to the book and is generally pretty gentle with it though she loves to touch the pages - particularly the string elements. She has a new-found love of the green monster since the publishers sent us this gorgeous cuddly toy monster. Check out our Twitter and Instagram pages to win one of your own. (Competition closes 10.7.17). Our full review can be found here. We only received this book at the weekend but BookBairn has read it dozens of times and I had to find a space for it on the Favourites Shelf. This is such an adorable story about two children, Ruby and Benji, learning to share their coloured blocks. The timing couldn't be more perfect for little BookBairn who is now entering the phase of toddlerhood where sharing is particularly hard, and of course she now has a little brother to share with! I adore the illustrations in this one too as they are deceptively simple and use primarily only red and blue colours making the children's valued blocks all the more important. But do they manage to compromise and share? And left on a cliffhanger when Guy shows up with his green blocks. Leaving it open for little ones to discuss what they think will happen next. No wonder BookBairn loves it so much - it's great fun! And a new addition to the Favourites Shelf feature is The Wee Page Turner's favourite. It's not really appropriate to shelve this one as we play with it a lot. Black and white high contrast illustrations from one of my favourite illustrators, the littlest reader in our house is captivated by the creatures. He also loves the mirror! 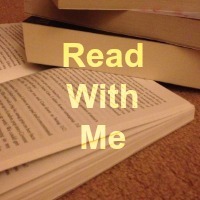 To find our previous favourite reads I've gathered them all on one page here. And you can always find the current list in the tabs at the top. Haha! I'm sure she can't wait to treat you to some more reads of these! 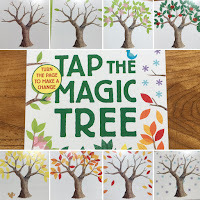 BookBairn picked Tap the Magic Tree for Saturday naptime and I loved it. She knew all the tricks and thoroughly enjoyed it - me too. I'm also a bug fan of Colour Monster. It's great! I'm glad she showed it to you! And wait until you get a cuddle from The Colour Monster! I love books that do things and I know that my son would have loved Diggersaurus when he was younger. It's funny how what children love in books hasn't changed much! You would love it! And Bug Bear is brilliant! What a lovely selection. Tap the Magic Tree sounds amazing! If we had a favourites shelf it would be full of Jacqueline Wilson! I loved Jacqueline Wilson growing up! I would have had them on my shelf too. Alongside The Babysitters Club and Animal Ark! It's great! I just realised there's another one in the series called Plant the Magic Seed. I want it! !